Among the targets of disillusioned Hillary Clinton voters is the much-maligned electoral college. The EC is misunderstood by most voters, from what can be judged on social media. Few seem to have any idea why it exists. Donald Trump condemned the EC during the recent campaign, echoing a typically populist attitude, yet it actually worked in his favor. And most are happy to accept the EC’s results when it works in their favor, but otherwise the EC strikes them as nonsensical. Here’s how it works: a state’s electoral votes are equal to the total number of seats it has in Congress: two senators plus the number of congressional districts in the state. Therefore, a state’s relative influence in the college is larger with fewer congressional districts (which are a function of population and land area). For example, suppose that each congressional district has a population of 1,000,000 (The actual average is closer to 750,000). A state with one congressional district gets three electors for its one million inhabitants. A state with two congressional districts gets four electors, or two votes per million inhabitants. A state with a ten congressional districts gets 12 electors, or 1.2 per million inhabitants. Therefore, voters in small states have more leverage on the outcome of presidential elections than voters in large states. Does that make sense as a mechanism for selecting the nation’s chief executive? The purpose of the Federal Constitutional Convention of 1787 was to forge an agreement between the individual states regarding a system of governance. This 1986 article by Shlomo Slomin in The Journal of American History provides an excellent account of the lengthy discussions that took place at the convention over how to select the chief executive. It was perhaps the lengthiest debate at the convention, as documented by Slomin. In the effort to create a durable union, a major concern was that a majority of voters were concentrated in states with interests, both economic and social, that differed from the interests of small states. One fear was that the executive would always be selected from one of the large states. Obviously, the New Jersey Plan was much more extreme in its departure from proportional representation than the final, agreed-upon EC. (Note that New Jersey was relatively small at the time.) The problem was finally referred to a committee late in the summer, which presented its plan a few days later. Each state legislature would choose electors, who would in turn elect the president. States would have the option of turning over the choice of electors to their voters. To paraphrase Slomin slightly, it removed the decision from Congress for selection of a president in favor of an independent, ad hoc body. The EC had a single purpose, would not meet at one central location, and would immediately disband, so there was little chance of corruption or “cabal” influences. In terms of votes, it was an exact replica of Congress. Originally, each elector was to vote for two individuals, but could vote for only one from their own state. The Constitution embodies other provisions that ensured a balance of power, all of which helped to bring disparate interests together into one federalist union. This includes the fact that we have two senators in Congress from each state. Alexander Hamilton wrote favorably of the EC in the Federalist Papers. The method of electing a president was subject to the same balancing of interests. 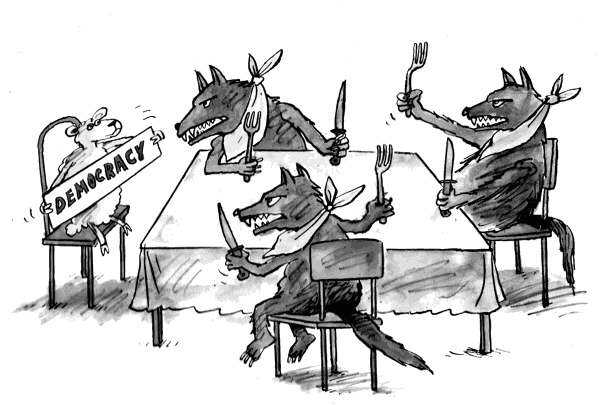 The founders had other reasons to think the EC was advisable. One was that it was impossible for many citizens, especially those in less populous regions, to truly “know” the presidential candidates. State electors, it was hoped, would relieve the citizenry of an impossible duty to perform a final vetting process. That rationale, however, might not be very compelling in the era of modern communication and social media. Another concern that arose was the appeasement of the southern, slave states. The issue of slavery was a lightning rod, but the northern states offered another “sweetener” to the south: the so called “three-fifths rule”, whereby three-fifths of the slave population would be counted in the total for allocating legislative representation. Even with that rather ugly adjustment, the southern states were generally less “populous”, but not as a rule. After all, Virginia was by far the largest state at the time of the convention. Certainly, the EC was an extra inducement to those states to approve the Constitution, but slavery had less to do with it than some have asserted, as the popular vote was never a serious contender for passage at the convention. In any case, the possibility of a union in which large states were dominant was obviously an issue for small states, and delegates from large states recognized the potential imbalance and the threat it presented to the success of the convention. Today, only nine states account for over half of the U.S. population. (Fifteen states account for over two-thirds.) Ten states accounted for more than half of the presidential vote count in 2012, which suggests that voter turnout in 2012 was slightly lower, on average, in the most heavily-populated states. Suppose we were to do it all over: if, for example, densely-populated states have interests that do not align with rural states, and if the latter are considered economically or culturally important, then the EC can be viewed as a worthwhile concession to offer in exchange for participation. The National Popular Vote Interstate Compact is a group of states that will pledge their electors to the winner of the national vote, but only when enough states join to total 270 electors. 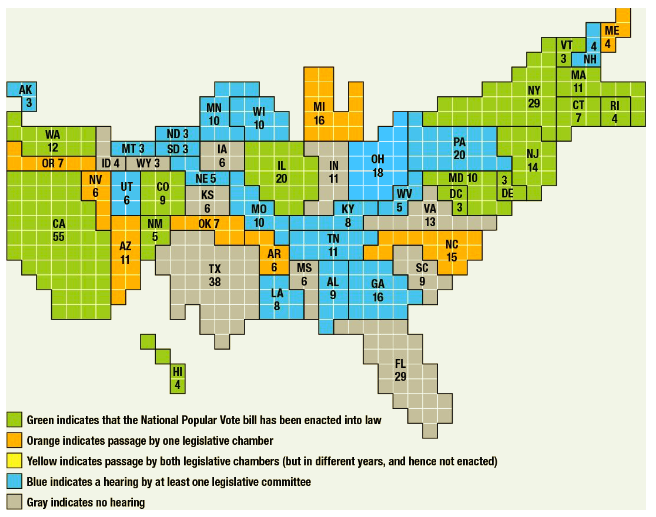 The compact now has ten member states plus DC, for a total of 165 electoral votes. These states are solidly “blue”, having voted for the Democrat in elections over many cycles. There are two states, with 36 electoral votes, in which legislation to join the compact is pending: Pennsylvania, which was carried by Donald Trump in last week’s election, and Michigan, which appears to have been carried by Trump. Something tells me the compact legislation will be risky for most legislators in those two states, but we’ll see. The voters of any state, under some circumstances, can have more leverage over the outcome of a presidential election when its electors are pledged to the winner of the in-state vote, rather than following the national popular vote. This can occur any time a majority of a state’s voters happen to disagree with a thin national majority. If states with 270 or more electors vote as a block, it diminishes the importance of each state’s voters, who might well disagree with the national popular vote in the future, if not already. The members of the compact, including California, would have had to vote for George W. Bush in 2004, despite the desires expressed by their citizens at the polls. Hamilton would not have approved of the compact; he wrote that a state’s electors should not be influenced by parties outside the state. Unfortunately, that rule was not clearly set forth in the Constitution. Sean Rosenthal just articulated a powerful defense of the EC appearing at FEE.org. He notes that the founding founders expected a fractured political landscape, with many parties vying for public office. They were wrong in that regard, he believes, because they agreed to two-year terms in the House of Representatives. Rosenthal cites Duvergers’s Law, combined with “first-past-the-post” voting for representatives, for the devolution to a two-party system in the U.S.: voters tend to avoid candidates who might help elect their least-favorite candidate. Given the existence of a system dominated by two-parties, the EC ensures stability by working against a concentration of power. Rosenthal reminds us that the EC transforms one federal election into 51 local elections. That reduces the chance of tampering by the party in power at the federal level. It also reduces the incentive for electoral fraud at the local level, since a greater margin of victory cannot gain the votes of additional electors. Rosenthal believes that these benefits would be powerful even if the number of each state’s electors was reduced by two, which would then cause the EC to approximate the results of the popular vote. As I noted earlier, the founders seemed to think that the EC would promote stability, and that belief was not conditional on the number of major presidential contenders. Another approach to the pledging of electors is used by Maine and Nebraska. They allow congressional districts to use their single vote independently, based upon the popular vote in the district. Certainly this is the most empowering approach for an individual district’s voters. I’m sure many voters in down-state Illinois would love it! There are plausible criticisms of the EC, such as discouraging voter turnout in non-“swing” states, and of course the disadvantaging of third-party candidates. On the other hand, some have argued that the EC can help the interests of minority voters by encouraging candidates to focus on winning their votes. And relatively small states like Mississippi have a proportionately large minority population, so the EC should help to advance their interests. The Electoral Collage is enshrined in the U.S. Constitution and was a crucial device in achieving an acceptance of the document by all the states. The delegates to the convention might have been able to overcome objections to proportional representation without the EC, but other, less desirable, concessions probably would have been necessary. Our country might look very different today without it. The EC certainly inures to the benefit of voters in smaller states who differ in their views from majority opinions. If we had to hold the convention all over again, some form of the EC would probably be necessary to achieve consensus, and obviously that has nothing to do with slavery. The EC is consistent with the federalist approach to governance, which is instrumental to maintaining the stability of the Republic. And voters can change their minds: even voters in large states might one day find themselves in a national minority. The Electoral College is undoubtedly a better way to protect the interests of those voters in the long-run than the Interstate Compact. It will probably survive the latest challenge, as it has survived many others in the past.